Lydia Apostol – Joyful Development Inc. Her name is Lydia Apostol. The business she runs is a youth clothes store. 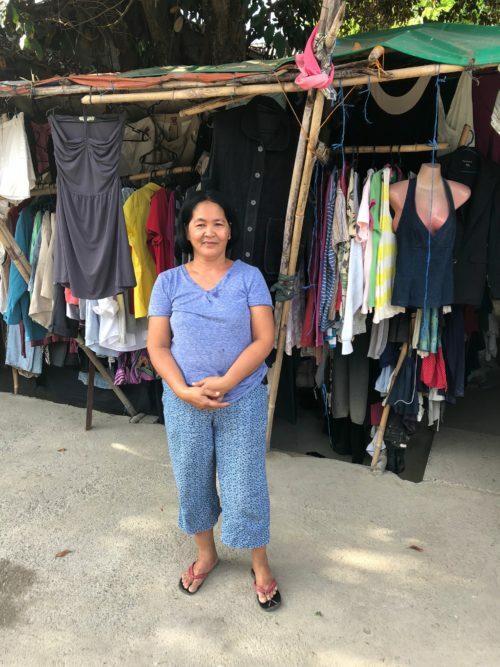 She works with Joyful since 2015, when she asked for a business loan of 15,000PHP, which was approved. Lydia says that Joyful is totally different from other microfinance institutions because JDI, and especially the Program Officer (Sir Albert) who works with her, didn’t run after her money when she had problems with her payments, they just tried to understand and help her. She feels like JDI acts like a real family to her, giving her advices, support and an understanding ear. On the contrary, other microfinance institutions with which she worked in the past were not interested in understanding her, they just wanted their money back, which prevented her from sleeping at night because of the worries.